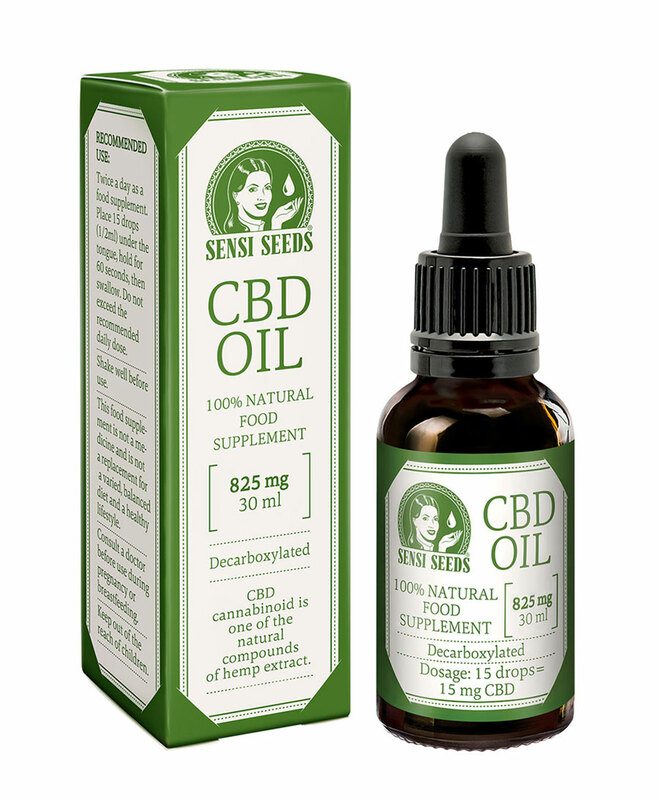 Sensi Seeds CBD oil is a food supplement based on cannabidiol, a natural constituent of the Cannabis sativa L. plant. One bottle of 30ml Sensi Seeds CBD oil contains 825mg of CBD (cannabidiol).This extract is made from hemp plants grown within the European Union, without the use of pesticides or herbicides, in order to produce a safe product of the highest quality. Sensi Seeds CBD oil contains different phytocannabinoids, the most well-known being CBD, CBC (cannabichromene), CBG (cannabigerol), and CBN (cannabinol).It also contains terpenes, including Myrcene, Limonene, Alpha & Beta -pinene, Linalool, B-caryophyllene, Caryophyllene oxide, Humulene, Nerolidol and Phytol. Other natural substances found in Sensi Seeds CBD oil include: alkanes, nitrogenous compounds, amino acids, sugars, aldehydes, ketones, flavonoids, glycosides, vitamins, pigments, and hemp seed oil. Store away from sunlight, heat and humidity. Refrigerate after opening. As a dietary supplement, use twice daily. Place up to 1/2ml (15 drops) under the tongue, hold for 60 seconds, and then swallow. 1 drop contains approximately 1mg of CBD. Consistent high quality is of paramount importance to us. Our CBD products are tested at every stage of the manufacturing process to verify the cannabinoid content and confirm the absence of contaminants. 825mg CBD Oil (30ml) is added to your shoppingcart! 825mg CBD Oil (30ml) is added to your wishlist!